Get the third edition of the paper map. The Wasatch Backcountry Skiing iOS app displays more than 1,000 backcountry ski locations in Utah's Central Wasatch mountains. 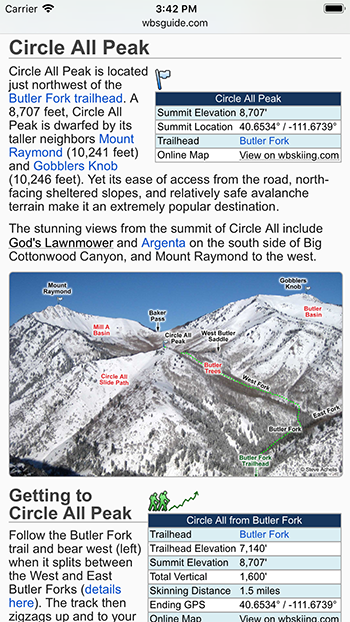 It's a companion to the Wasatch Backcountry Skiing website, paper map, and Android app. The app requires an iOS device (i.e., an iPod Touch, iPhone, or iPad) running iOS 8 or later. The app does not require cell service. The Wasatch Backcountry Skiing iOS app is available exclusively from the iTunes App Store. Learn about troubleshooting the iOS version. Tap the App Store button on your iOS device and choose Updates to make sure you have the latest version. Version 3.5.0 was released on December 11, 2017. This version is now linked to the Wasatch Backcountry Skiing Guide website. This version also has a new base-map with dozens of additions and improvements. As always, it's a free upgrade. Version 3.0.2 was released on October 24, 2017. This version improved approximately 25 of the names in the list of locations (some tweaks, some additions). Version 3.0.1 was released on January 10, 2017. This version improved product stability. Version 3.0.0 was released on November 17, 2016. This version shows ski area boundaries, the 30° slope-shading is darker, the accuracy of the GPS was improved, dozens of minor changes were made to improve the location names, and several usability improvements were made (e.g., the small compass is now always displayed on the map). The backcountry locations displayed in the app are approximations. You should not expect the app to position you precisely on a run or at the entry of a chute. We welcome your suggestions to improve the data. Hundreds of the locations that are displayed in the Wasatch Backcountry Skiiing app are linked to the Wasatch Backcountry Skiing Guide. These locations display "links" next to their names in the app. After selecting any of the linked locations and tapping on the "Tap here for more ..." box, information about the location will be displayed in Safari (view screen shot). The information includes details such as skiing difficulty, skinning distance, vertical climb, altitude, aspect, and slope angle. You can tap on the "WBSkiing" text in the top-left corner of Safari to return to the map app. Zoom in by double-tapping or by pinching; Zoom out with a two-finger double-tap. Move the map by dragging the screen. Rotate the map with a two-finger twist. When the map is rotated, a small compass is displayed in the upper-right corner to show the map's orientation. Tap on the compass to return to the north-up orientation. Tap on the search field and type a portion of the location name (e.g., "chute"). Then select a name from the list. A purple pin will be displayed on the map. Some locations names are abbreviated and require appropriate search terms. For example, "Mount Olympus" appears in the list as "Mt. Olympus" so it won't appear in the list if you search for "Mount". Tap on a pin to display its info banner. Tap on the info banner's button to begin navigating to that location. After tapping on the info banner's navigation button, the navigation page will be displayed (you can also display the navigation page by tapping on the Navigation tab at the bottom of the screen). The navigation page displays information about the destination. A blue arrow points toward the destination. Important: The blue navigation arrow points toward the destination and does not consider avalanche danger, cliffs, rivers, rock fall, or any other hazards. Backcountry travel can be dangerous. It is your responsibility to mitigate hazards. Important: The compass accuracy can vary by ±10°. Look at your surroundings to avoid "GPS tunnel-vision." You can cancel navigation by tapping the button on the navigation page or in the info banner. Your current location is displayed as a blue dot. Tap the current location button in the lower-left corner of the map to display your location (i.e., the blue dot) on the map. If you are outside the map's boundaries, a blue arrow will point toward your current location. Tapping the current location button a second time orients the map relative to the earth. A flashlight-like fan extends from the current location dot to show the direction your device is pointing. 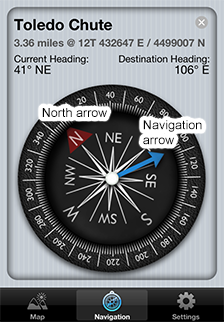 Tapping the current location button a third time, or tapping the small compass, returns to the north-up orientation. To drop a temporary pin, press and hold on a location. You can then tap on the info banner to begin navigation to the pin's location. Press the Email Current Location button at the bottom of the Navigation page to send an email containing your current location. You can also send us a location to help us improve the map's database. 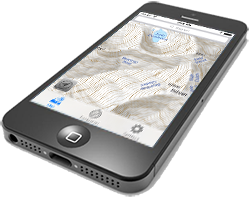 WBSkiing relies on GPS satellite reception to determine your location and to point to destinations. Cell service is not required. The GPS signal strength is displayed at the bottom of the navigation page. 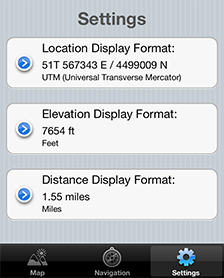 The Settings page lets you specify how latitude and longitude, elevations, and distances are displayed. On iOS 7 and later, tap on Privacy. Make sure the location services are turned on near the top of the screen. 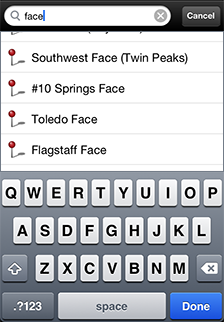 Scroll down the list of installed apps to WBSkiing and make sure location are turned on. I've seen the compass app in the iPhone be off by 90-degrees. When that happens, the compass in the Wasatch Backcountry Skiing App is also off. There are instructions on how to calibrate the iPhone compass, but I often can't get them to work. Contact me if you discover any tips to calibrate it. For additional assistance, please contact me.